The taste: This is one tasty puppy; when you bite into it, there’s a good snap to the skin. The fries also are a cut above -- crispy on the outside, soft inside, and nicely seasoned. The chili, however, is just okay and the cheese basically acts as a glue holding everything together. The takeaway: Once a tourist mecca, always a tourist mecca. While waiting in line, you can look at the spread of cheesy 8x10 celebrity photos and ponder how many people actually order a Brando or a Rosie O’Donnell (they’re among Pink’s “star dogs”). The alternative: La Brea & Melrose offers a ton of other choices -- Chipotle, Hot Wings Cafe, and Lucifers Pizza -- but if you’re in a meat mood go to Bludso’s. 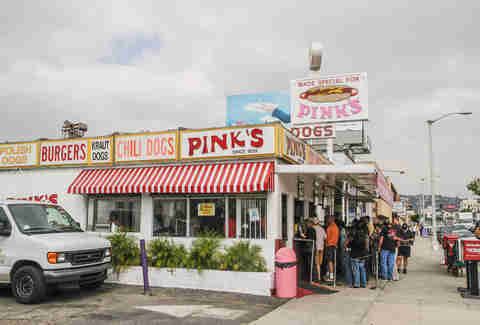 The verdict: Do it -- if there is a hot dog worth standing in line for, Pink’s is probably it. 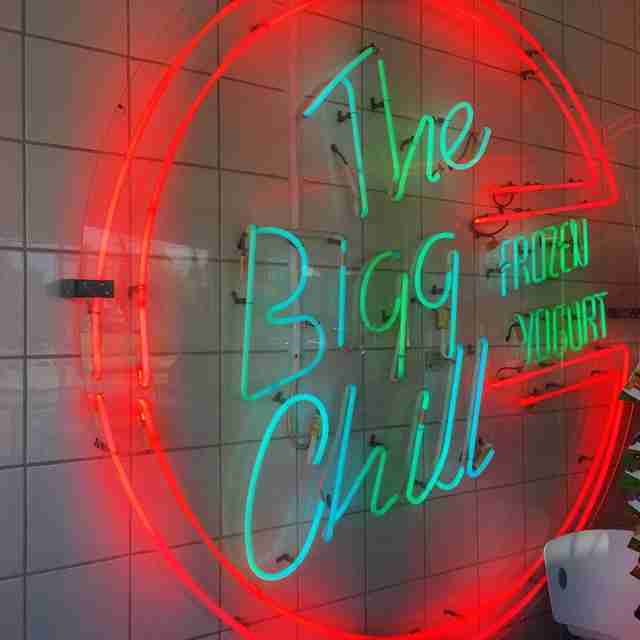 The food range from good to great and the LA kitsch factor can’t be beat. The taste: Sublime -- the big slab of ice cream is barely contained between two chewy cookies. Sure, it’s messy, but that’s part of the fun. The takeaway: This is Westwood so there are gaggles of UCLA students, which means (bonus!) you get to eavesdrop on their college dramas. Just don’t try to pass as a fellow student or, even worse, tell a story from your collegiate glory days. 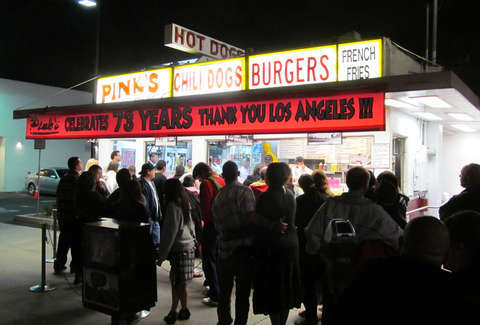 The alternative: The only real dessert alternative is Stan’s Donuts, another sweet Westwood icon. The verdict: Do it -- this is probably the most worth-the-wait stop on this list, unless you have something against cookies and ice cream. The taste: Subtlety isn’t on Griddle Cafe’s menu. The manhole-sized pancakes are syrup sponges but these doughy behemoths can dominate whatever toppings they come with. The huge ham slice could be a meal on its own. The takeaway: It’s no surprise that smaller parties often get seated more quickly than larger ones, but it’s particularly true here as they have two wait lines: one for small parties and another for big groups. 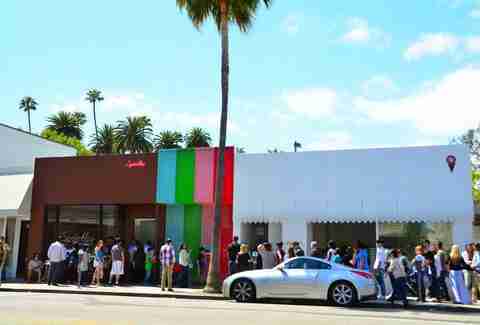 The alternative: When it comes to breakfast places at Fairfax and Sunset, you pretty much just have Griddle Cafe. The verdict: Do it -- but only if you like leftovers/don’t go with 20 people at 10am on Sunday. Really though about the leftovers thing: you can legit make two more meals from your epic flapjack stack. The taste: Wonderful. A rarity of something living up to its hype. The egg was soft but not too runny. The bacon comes thick and crisp. The spicy ketchup adds a kick without massacring your taste buds. 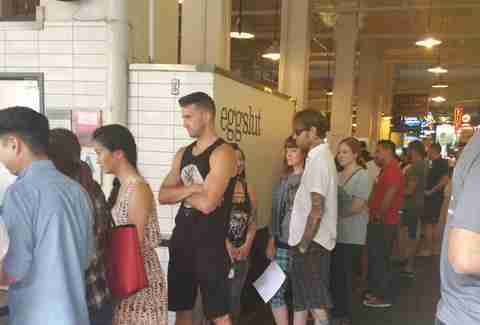 The takeaway: Standing in line amidst the Grand Central hipsters is like a real-life episode of Girls. The alternative: The Market has transformed into a foodie paradise (that you can gloriously hack). 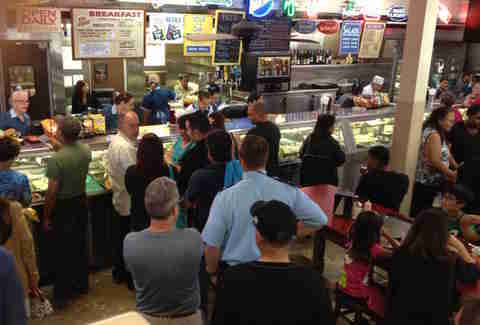 You’ll also find lines at Sticky Rice, Olio, Wexler’s... basically every place. The verdict: Do it -- the food is four stars, and you’d have to wait at the alternatives, too, anyway. The taste: It’s a classic-style crispy-shelled taco that’s freshly made and cheap, but the shredded cheese is standard issue, the beans rather gummy, and the salsa is like a puree. The takeaway: First-timers should know the following: don’t ask for chicken (no pollo), bring cash (no credit cards), and know that you can order inside as well as out. The alternative: A few steps away is fellow taqueria Cinco de Mayo as well as another neighborhood mainstay, Johnnie’s Pastrami. 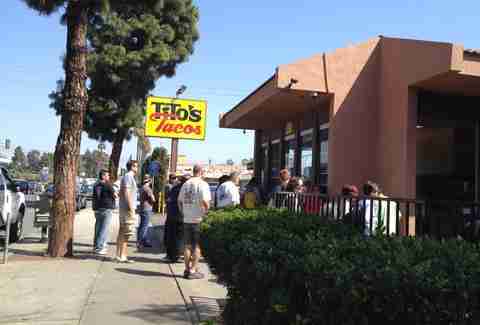 The verdict: Don’t do it -- while it’s better than fast-food Mexican, it’s not special enough to warrant a wait. The taste: This is top-notch ramen right here; rich, flavor-packed comfort food that’s like the Tokyo version of chicken soup. The takeaway: If you know Japanese, there’s a lot to overhear. 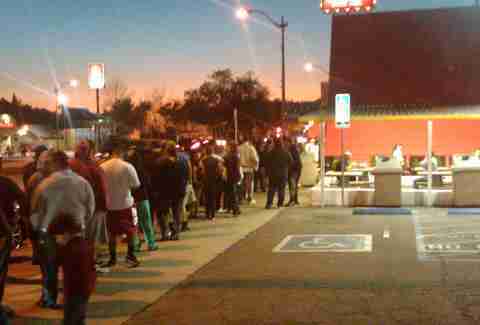 And get there early because the line only grows into the night. The alternative: Located just below Olympic, its mall neighbors, strangely, are Baja Fresh and Panda Express. 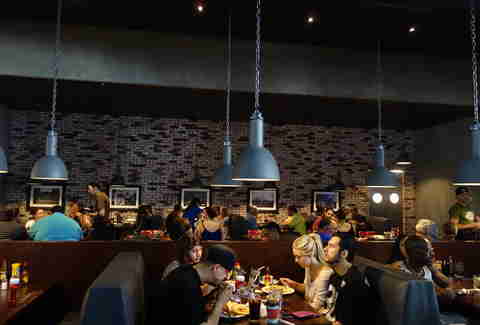 But a few blocks North on Sawtelle’s restaurant row, the options include Tsujita, Tatsu, ROC, and SushiStop. The verdict: Do it -- the wait is worth it at this tiny restaurant and it helps that the service typically is swift. The taste: Nothing flashy but filling. The thick clam chowder offers a taste of New England and the nice, straightforward slab of grilled fish satisfies your seafood craving, although you’ll get more flavor by going Cajun style. The takeaway: Great place to get the beach volleyball news and check out the latest trends in sunglasses. Eat on the outside patio and you’ll feel like you’re picnicking by the Pacific, without the sand and other annoying beach things. The alternative: Once you’re cruising up the PCH, there aren’t many other choices around there beyond the pricier Mastro’s and Gladstones. 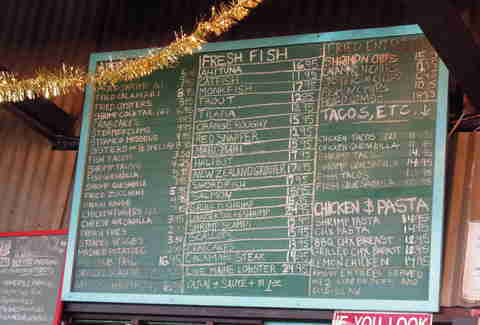 The verdict: Do it -- this Malibu-style fish shack is a fun, flip flop-friendly spot for (near) surfside dining. The taste: The BBQ nicely balances sweet and spicy, but it’s not taste bud-exploding awesome. The cornbread and beans are ordinary and the mac & cheese has an unusual garlic powder-like taste. The takeaway: If you are going on a Sunday, try to avoid the post-church crowd. 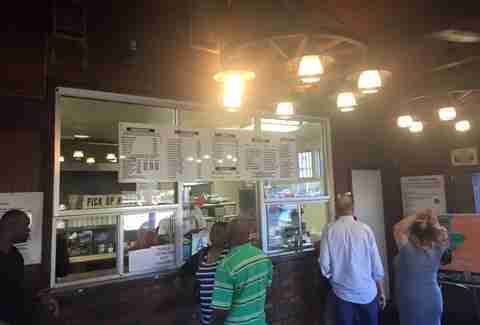 The alternative: Skip the nearby Mickey D's and Pollo Loco and check out Chef Marilyn’s, a little gem of a soul food spot slightly South on Crenshaw. The verdict: Don’t do it -- very good but not knockout-good BBQ. Don’t make a special trip but it’s probably worth a stop if you’re in the neighborhood. The taste: It’s In-N-Out. Duh. The takeaway: It tries to keep the line moving with a bellhop guy taking your order on an iPad as you slowly snake forward in the line. Going inside the restaurant isn’t much faster as there are lines out to the door, too. The alternative: There’s a 24-hour IHOP across the street if you need something after hitting the Hollywood bars and, if you really want a burger, the Oinkster is less than two miles away on Vine. 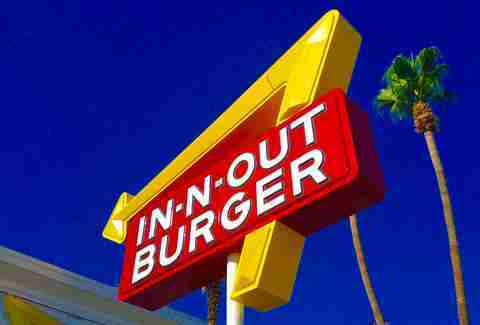 The verdict: Don’t do it -- some people don’t like In-N-Out. I’m one of those people. Sue me. The taste: Accept no imitators: Tommy’s chili offers a nice kick but can dominate the burger and fries. Eat the fries fast before they get soggy. The deli pickle slice adds a nice extra touch for the burger. The takeaway: Besides the main grill shack, there’s another order counter across the parking lot -- and sometimes it opens up another counter in the second parking lot. The alternative: There’s a Taco Bell across the street but not much to really recommend in the neighborhood. The verdict: Do it -- while not the finest burger to be had, it’s a good one and definitely serves as a reliable 24-hour destination if you’re headed in or out of the Eastside. The taste: This is quite the tasty cupcake. The icing doesn’t overwhelm the cake, which is on the right side of moist. The takeaway: Too full for a cupcake? Get a frosting shot for $.75. Or skip dessert altogether and buy a miniature Sprinkles toy bakery set for $15 (or the price of about four cupcakes). The alternative: You can satisfy your sweet tooth at such mainstays as Bob’s Donuts or Bennett’s Ice Cream. Or there’s Dylan’s Candy Bar or Du-par’s pie shop, or... you get the picture. The verdict: Don’t do it -- granted, it is a good cupcake. But it’s still a cupcake, and gourmet cupcakes are always better when someone else is buying. More fun, and filling, dessert experiences can be found at the Farmers Market. The taste: The French dip is old-school delicious, although the gravy can turn the bread mushy if you don’t watch out. If you like saucy coleslaw, then you’ll like Philippe’s. The takeaway: On the counter are big, scary jars of deviled eggs floating in lurid purple-y liquid, which looks like something from a ‘50s sci-fi movie. The alternative: When it comes to French dips, Philippe’s only rival is the now more upscale Cole’s, which is deeper Downtown. Around Philippe's, your choices are mostly Chinese restaurants. The verdict: Do it -- revel in the gloriously downscale dining: sawdust on the floor, tchotchkes on the walls, and cheap-but-tasty eats. The taste: This fro-yo certainly is refreshing, although there can be a slightly artificial taste. Getting an add-in, like the cookie dough, helps, but of course that increases the calorie count, which some people care about, I hear. 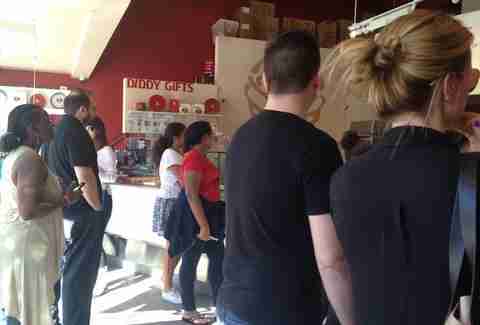 The takeaway: People love to ponder over getting a free sample, which is annoying if you are waiting behind them. It’s just frozen yogurt people! The alternative: Across the street to the North, there’s a Penguin’s and, to the West, a Baskin-Robbins. The verdict: Don’t do it -- if you are going to have dessert, go for a couple more calories and get something more filling and tastier. Michael Berick was born and bred in Ohio but now lives in LA and doesn’t miss de-icing his car. He writes about music, family entertainment, pop culture, and non-fine dining. You can find him on Twitter and Instagram: @michaelberick.